DawnSinger is definitely not a bad book, in case that's how you interpret a 2.5 star rating, yet this book just didn't resonate with me personally. I read it in one day, so this book was by no means a chore to get through, but nothing really made it stand out. 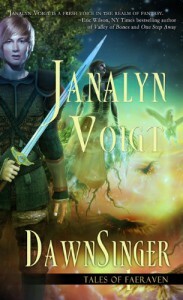 After all, there's nothing I love more than a fun fantasy adventure, but even though DawnSinger started with a lot of promise, I felt that it never really took off. Essentially, all the exposition in the first part of the book was pretty interesting, but once Shae, Kai, and company went on their journey to find the DawnKing, the book just kind of staled. Normally in a fantasy, the journey is the most exciting part, but for DawnSinger, it wasn't. Everything just seemed really formulaic: Walk, walk, walk. Creature attacks, Shae has a near death experience, Kai has a near death experience, creature is defeated or avoided. Relief, tend to injuries, rest. Walk, walk, walk. Creature attacks, Shae has a near death experience, Kai has a near death experience, creature is defeated or avoided. Lather, rinse, repeat. Then, when it came to the final showdown, so to speak, everything was over really quickly and it was all kind of anti-climactic. Also, something really significant happens at the end, and there seemed to be no character reaction to it, which made the book lack any significant closure. The writing in the adventure scenes didn't do the story any favors, either. Although the book was well-written, I don't think the writing was flushed out enough to keep the story engaging. There just wasn't enough imagery for me to feel like I was on the journey with the characters. As for the romance - normally I really enjoy having some romance in my fantasies, and the romance in the book was actually really sweet. However, it was also really strange, for reasons that will become obvious as your read the book, and I just couldn't get past that. I mean, even though Kai knew his whole life that Shae wasn't his blood-relation sister, and the reader knew early on that this was the case as well, that doesn't change the fact that Shae thought Kai was her brother for her whole life. I mean, if I found out today that my brother was not actually my brother by blood, there's still no way my love for him would ever transition to romantic love, because, ick ick ick. Not to mention, since Shae's real parentage is kept mostly a secret even after Shae finds out, everybody else still thinks they are brother/sister, too, so that's kind of weird to think about. Finally, all the Christian allegory and God constantly saving the day stuff wasn't really my cup of tea, since I'm not a religious person. I just wish it had been included with a bit more subtlety. And, besides, it's kind of cheap in a fantasy book if it just takes some good old-fashioned faith in God to beat your enemies. It just seems a bit too lazy and convenient for me. So, yeah, as it turns out, this wasn't the book for me, but I could definitely see how people could really enjoy it. It had some really interesting elements, but in the end, they weren't threaded together well enough for me to come to love this story.